Tadong is a small place 2 KMs away from Kaluk bazar and 3 KMs away from Rinchenpong. It is not known as a tourist place. No hotel or resort available to stay there and only option is Tamu Home Stay. 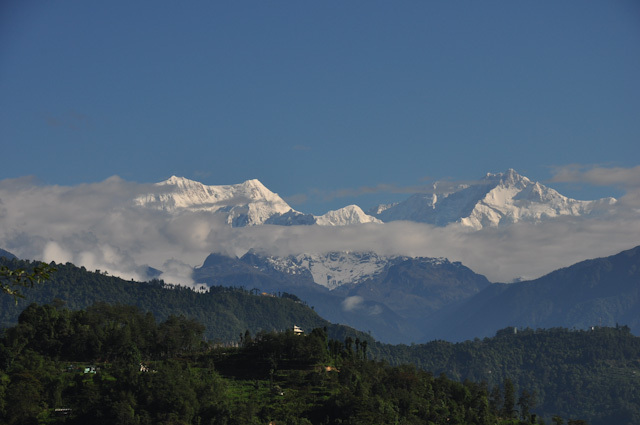 Mt Kanchendzonga is visible from every part of Tadong and there is no particular view point for that. 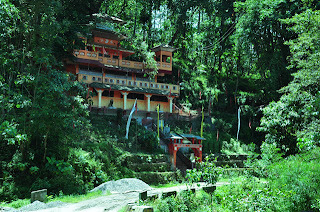 To enjoy the place have gentle walk along the hidden pathways and pak-dandis amidst lush green slopes. There are so many things to explore and the best among all is "Resum Gumpha". A small trek from Rinchenpong will take you to the abode of God. There is something inside my head and it always bugs me in a while to go out in search of SOMETHING - that something I can't explain in words. This time I was in search of a lesser known place, and I found Rinchenpong-Kaluk-Barmiok while Googling and a nice partner, Sayan, in my office (this one without Googling). It was one bright sunny Friday and we left for Siliguri. We did the booking earlier. So the journey was comfortable but uneventful. Traveling by train always gives you the option to interact with different people and that is why train journey is never that boring. We spent some time talking with co-passengers then had a sound sleep. May be it sounds odd, but I really enjoy my sleep during train journeys. The train was late …we were really hungry by the time we had reached NJP. But at that time it was much important to find a transport to Jorethang than to fill our empty stomach. So ignoring our growling belly we left for Siliguri. We had got a shared Taxi, two of us and two other families. The journey started along the same old paths around 10:30 am. We were on the front seat beside the driver and I believe that is the best place to enjoy the journey. We had reached Jorethang around 12:45 PM, there we came to know one of the two families, is also going to Rinchpong. We decided to go together. We took lunch break in Jorethang, before we left for Rinchenpong.The family – Avikda, his wife and two children - Riju and Titli joined us for lunch. Soon after we had completed our lunch we left for Rinchenpong. We had booked the car before our lunch and the driver was waiting. Our journey was good and without any trouble. We had enjoyed a lot with talkative Titli and game playing Riju. When we reached Rinchenpong, both of us decided not to stay there because the place seemed to be crowded. So in the same car we went to Kaluk bazar. Avikda had a booking there in some resort and we said goodbye to them in Kaluk and went in search of a place that is a bit isolated - and we found TADONG - a hidden gem of West Sikkim. It was raining in that part of world, but not heavily. We were talking with the local people to find a place that matches our criteria. A wine shop owner told us about Tadong at that time. He told us there is no resort or hotel in Tadong but we can stay there in TAMU HOME STAY. We decided to go there and check our luck. It was almost 2KMs away from Kaluk Bazar, not a long distance and we wanted to sense the new place, so we started walking. At that time it stared raining very hard. Again we had a local companion to show our way and he helped us to find Tamu Home Stay. When we saw that place I told myself - "yep, this is the place and we are going to stay here". It was not really cold or warm - the weather was soothing and the best part was a big balcony from where you can get the panoramic view of West Sikkim and on a sunny day the snow covered peaks of Himalayas are visible from there. We went for a walk just after checking in and went to Kaluk again to visit our newly made friends - Avikda and his family. We spent about an hour with them and came back to Tadong. The dinner was ready for us - chapatis, chicken and the local wine thumba or chang. I really had enjoyed Thumba. 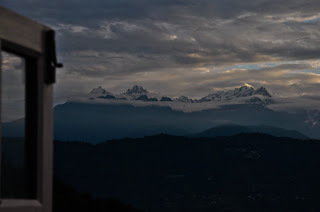 We went to bed early just because we didn't want to miss the sunrise and early morning Kanchenjunga. Sayan wakes me up in the morning. It was a bit cloudy and Kanchenjunga was hidden behind the clouds. It was so amazing to sip the morning tea, looking at the picturesque Tadong from the balcony and thanks to Tamu Home Stay for providing us such warm hospitality. 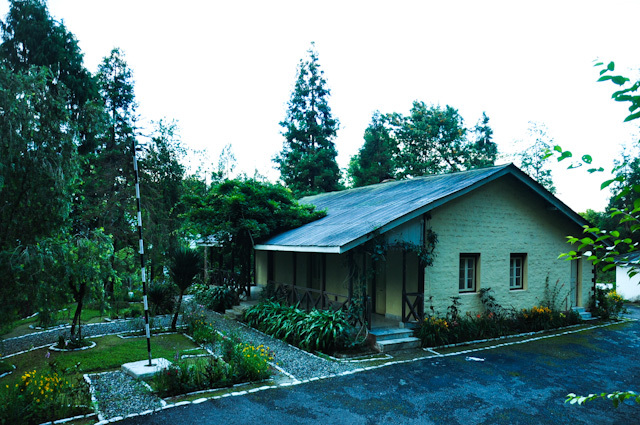 Tamu Home Stay is own by Raju Gurung, His wife looks after the business as Raju remains busy with his job. Their two daughter, Pranita and Sahikala helps them to manage the business and amazingly without hampering their studies. We had a plan ... to not plan anything in this trip. Avikda & family joined us in the morning. We had many options but we decided to explore the locality following the mountain trails. Pranita and Sashikala was there as our tour guide. We started our journey by knowing their kitchen garden.The main crop they grow is "makai" or "bazra". Sashikala bring us some pitch and we were munching those whenever we were feeling hungry during the walk. First they took us to a view point over the nearby hill and from there to the "Singabahini Mahakali Temple". I particularly like this temple because of the ambiance. An old "pujari" was there. He stays there in the temple to do the "puja" everyday.Here in Sikkim you will find people of every religion are staying together happily. You will find a mandir beside a gumpha and a gumpha beside a church. Our next target was a nearby gumpha that was visible from there. After visiting that we returned back to Tadong. It was an wonderful afternoon. We had our lunch together. Then it started raining. We were sitting there in the balcony ... gossiping ... waiting for the rain to stop ... and when it stopped there was a gracefull rainbow just infront of us as if we could touch it from the balcony! We went back to Kaluk bazaar. Avikda told us about a monastery - "Resum Gumpha". We were not aware of that. We decided to visit it. We left that family in Kaluk and started walking towards Rinchenpong. In the midway we got a car ... The driver was an young lad. After reaching Rinchenpong his friend joined us. When we told them that we are going to visit Resum ... they were surprised. "Aap log char nhi paoge ... 300 siriya hai udhar, andhera ho jayega" - you will not be able to reach there, there are 300 stairs and it will get dark soon. Actually the guy was wrong ... there are over 1000 stairs you need to climb to reach "Resum Gumpha". Anyway, they had agreed to drop us near an old forest Bungalow for 100 bucks, from where the trail starts. We left the car there and spent some time in the garden of that bungalow. Then our journey to "Resum Gumpha" began. When we had reached the gumpha, both of us were breathing heavily. But we made it before the sunset - it took hardly 30 mins to reach Resum Gumpha. The place looks so old ... it seemed that nobody visited that place recently. There was an old stupa (they call it "Mane") and I was taking a few shots there. From there when we had reached the main gumpha, only a few steps ahead, it was already dark. There, suddenly Sayan screamed. Following him, what I saw was amazing! Now we know why the Buddhist monks selected this place for their living. The beautiful Himalayas was clearly visible from there.We were not feeling like leaving that place ... addicted ... mesmerized ... that place is really an abode of God. How to reach Resum Gumpha:Resum Gumpha is almost 4KM away from Kaluk bazar. The road is not motor-able and you need to trust your legs to reach there. trust me it is not difficult to reach Resum Gumpha and if you are in Rinchenpong it is a must visit place. For someone starting from Rinchenpong, there is a British Bungalow nearby and the stairs towards Resum Monastery starts from there. You don't need a guide for that trek, just ask local people and they will guide you. I have a guide map of Kaluk - Rinchenpong area to share. But we had to, at last. It was already dark, and much so inside the forest. The deemed light of our mobile is all we had to see and descend down the slippery steps. When I left Resum, I felt something is entering my shoes - I knew that feeling,I knew what it is but I completely ignored that due to the lack of light. After coming back to Rinchenpong I had to remove those 7 leeches from my feet. Both of my feats were covered with blood. Sayan was lucky enough, not to get any of those creatures. It was kind of an adventure indeed. It was around 7:30 PM and we were unable to get any car back to Tadong from Rinchenpong, so we started walking. In between we stopped by a shop to clean my legs and get some band-aid.The shop owner was a nice young lad and he managed us a car to Tadong. There everybody was waiting for us and they were bit worried. Raju was surprised to know that we went to Resum Gumpha after dusk. "Udhar to bhoot hai ... There is a ghost there". Then he gave us the description of that ghost ... a creature with two horns that looks like human otherwise. Raju served us the dinner that night, it was late and his wife had fallen asleep. After dinner we had a few sips of chang and went to sleep, the cosy-comfy bed was waiting for us. We were pretty tired due to the walking we did last day. But somehow my eyes opened around 4:30 am and I must say I was lucky. The sky was clear and the finest artist of this universe was creating magic on her canvas. I saw Kanchenjunga many times before - but every time it brings new surprises for me. I was so eager to share it I almost forced Sayan to wake up, and I bet he is not angry for that. It was like a gift from mother nature. We had our tea looking at golden yellow Kanchenjunga and then left for a walk. The weather of West Sikkim during May - June is very comfortable. Seldom I had my sweater on during the whole tour. 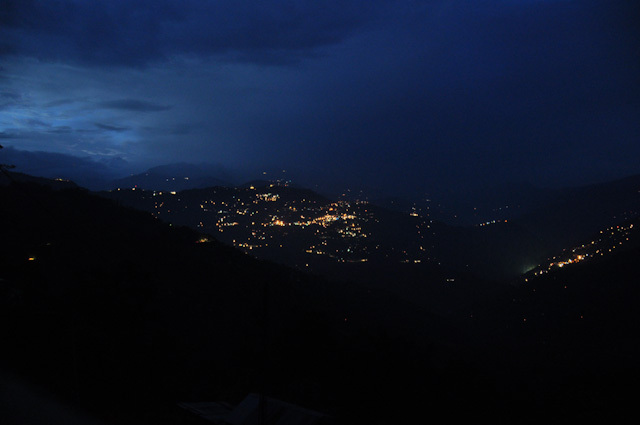 Most of the people avoid West Sikkim during monsoon but I cannot agree with them. The greenery during rainy season adds to the beauty of that place. It looks really nice , just wanted to know if we travel in December will it be snowing there ? You really lucky to stay near such good locations, I really loved reading your blogs. Njoy Buddy . Wonderful blog, Surajit! and the snaps just make it perfect. 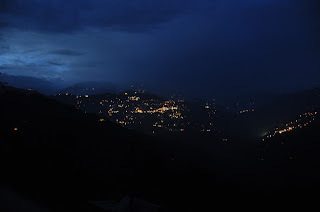 I was looking for information on any offbeat place in Sikkim and came across your post. I need some help about planning my honeymoon in early July. I have heard that it rains at that time in Sikkim but I don't mind that as I'm sure it adds to the beauty of the place. After reading your post on Tadong I am tempted to stay there. Do you have the contact number of the owner with you? 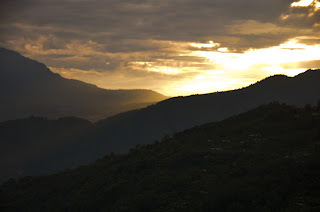 As an experienced traveller to Sikkim, could you suggest me some places for a 5-6 day trip? Any help, much appreciated! You have a very nice blog too ... nostalgic. I really have enjoyed reading the blog about your pet cat - saheb. Yes I have the contact of the owner. Mr Raju Gurung (9733270189). But if you are going for a honeymoon trip, then I will suggest you to follow the "Silk Route". You will be able to cover it within 6 days. we are going to kaluk-rinchenpong on this 24th of May. I really liked the blog and the pics. But I didn't find the time you went there. Can you tell me the weather at this time of the year? It was last week of May. The weather was really good with occasional rain fall. The monsoon didn't ruin our days though. Happy journey and I hope you will share your experiences too. Feel free to contact me if you have other queries. Nice blog. I really liked it along with awsome pics.. Going to Kaluk and Pelling in ensuing 25th Dec.. I got Raju gurung's contact from one of comment. Do you think pre-booking is necessary, or can we get spot booking which might cost less. there is no agent in between, so the rate will be same if you pre-book or spot-book. The room rent should be around 600 Rs and if you travel in a shared vehicle, that will reduce the cost drastically. 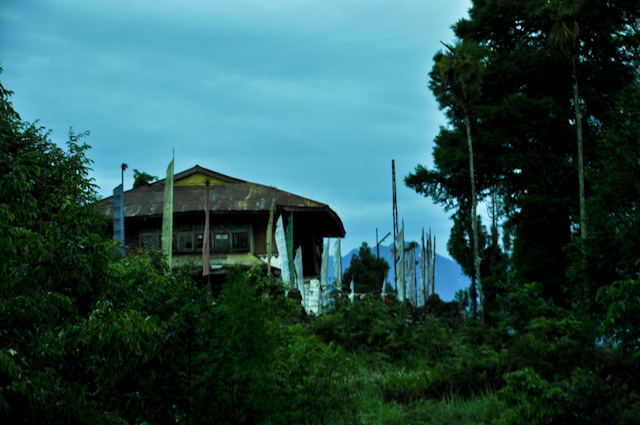 Can anybody please provide me the latest contact details of Mr Raju Gurung of Tamu homestay at Tadong ? 9733270189 -- is it not working? Bichut pata and soup.. wow! Sound interesting. I called the number and talked to Mr. Raju's wife. She quotes Rs1000 for view room and Rs.800 for non-view room, if anybody is interested to know about the tariffs. I had a few more detailed questions, my gmail account is sayanide1984@gmmail.com. Please ping me, if that's okay and I will ask a bit more :) . I am planning my trip in early November and have a very limited window to travel for 6 days , so trying to get as much information as possible. Sayani,had you visited tamu home stay?I will go may 23rd 2017 with my wife and 4 yr kid,what is the cost per room?is it OK with a small kid?how far is kaluk bazaar?any communication available from there to other part?please reply and give the contract number of Raju. How much do they charge for homestay as i know it includes all meals too. 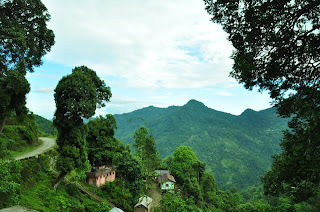 Thanx Surajit for such a beautiful blog.I could visiualise the place.Iam planning to visit the place with a team of 12 ppl.will that plac accomodate us and kindly provide me the contact no of the home stay as the no given here is not working.Also if u hav any contact no of Kaluk . Hi Lopa ... glad that you liked. I believe they can accommodate 12 people with their current set-up if that is a group of friends/family. Kaluk is a very popular destination now a days and there are several hotels/resorts available there. Let me try to contact Raju Gurung and will update you about the phone number. 1) In which year you went ? 2) Any updated Raju Gurung's Number ? 3) I am planning to visit in the last week of this October, 2017, So how will be the weather? * This is not a question but just a information: Please visit Ahaldara, its near Latpanchar. You will be amazed. 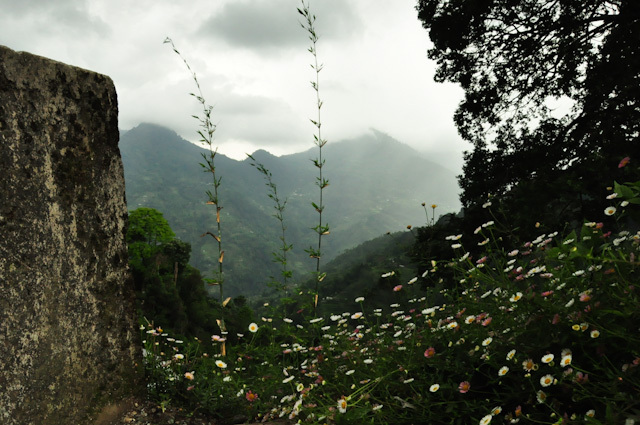 This is a place near Kalimpong. Thanks for the information :-) and sorry for late reply. I visited that place last time during 2014. This is a pic of tamu homestay: https://www.flickr.com/photos/92363588@N02/23112311913 ... you will get numbers from there. Hope those are still active. Last week of October is a good time to visit. Your comment will appear after moderation. I just don't want too many spam messages in my blog but only genuine comments from travelers. ©Surajit Ray(Jito), Durgapur, West Bengal, india. Powered by Blogger.